In a recent blog post, Kingsley Idehen picked up on the UMBEL project’s mantra of “context, Context, CONTEXT!” as contained in our recent slideshow. He likened context to the real estate phrase of “location, location, location”. Just so. I like Kingsley’s association because it reinforces the idea that context places concepts and things into some form of referential road map with respect to other things and concepts. 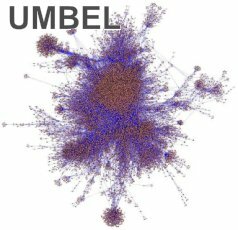 To me, context describes the relationships and environmental proximities of what UMBEL calls subject concepts and their instance sub-concepts and named entity members, the whole of which might be visualized as a graph of reference nodes in the firmament of a global knowledge space. Well, hmmm. I must beg to differ. I suspect as we now are seeing Linked Data actually enter into practice, new implications and understandings are coming to the fore. And, as we try new approaches, we also sometimes suffer from the sheer difficulty of explicating those new understandings in the context of the shaky semantics of the semantic Web. The dominant RDF link ‘glue’ for Linked Data that has been used to date, the owl:sameAs predicate. Therefore, since UMBEL is putting forth the argument for the importance of context in Linked Data, it is appropriate to be precise about the semantics of what is meant. 2: the interrelated conditions in which something exists or occurs: environment, setting <the historical context of the war>. 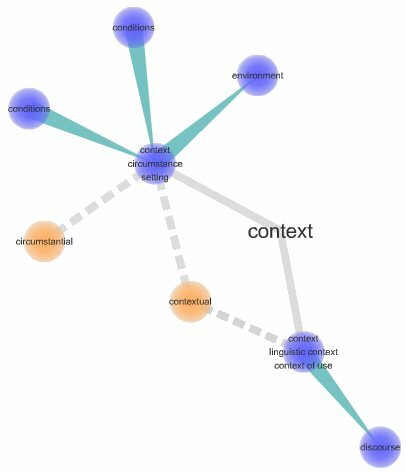 Another online source I like for visualization purposes is Visuwords, which displays the accompanying graph relationships view based on WordNet. Both of these references, of course, base their perspective on language and language relationships. But, both also provide the useful perspective that context also conveys the senses of environment, surroundings, interrelationships, connections and coherence. Context has itself been a focus of much research from linguistics to philosophy and computer science. Each field has its specific take on the concept, but I believe it fair to say that context is consensually used as a holistic reference structure that tries to put all worlds and views, including that of the observer and observed, into a consistent framework. Indeed, when that framework and its assertions fit and make sense, we give that a word, too: coherent. Hu Yijun , for example, intersects the interplay of language, semantics and the behavior and circumstances of human actors to frame context. Yijun observes that an invariably-applied research principle is that meaning is determined by context. Context refers to environmental conditions surrounding a discourse and its parts which are related with it, and provides the framework to interpret that discourse. There are world views, relationships and interrelationships, and assertions by human actors that combine to establish the context of those assertions and the means to interpret them. In the concept of context, therefore, we see all of the components and building blocks of RDF itself. We have things or concepts (subjects or objects) that are related to one another (via properties or predicates) to form the basic assertions (triples). These are combined together and related in still more complex structures attempting to capture a world view or domain (ontology). These assertions have trust and credibility based on the actors (provenance) that make them. In short, context is the essence of the semantic Web and Linked Data, not somehow in variance or conflict with it. Without context, there is no meaning. While one interpretation might be that the characteristics of one individual (say, Quebec City) might be oriented to latitude and longitude in a GeoNames source, while the characteristics of that individual may have a different context (say, population or municipal government) in the different DBpedia (Wikipedia) source, we need to be very careful of what is meant by context here. The identity of the individual (Quebec City) remains the same in both sources. The context does not change the individual nor its identity, only the nature of the characteristics used to provide different coherent information about it. With the growth in Linked Data, we are starting to hear the rumblings around possible misuse and misapplication of the sameAs predicate . 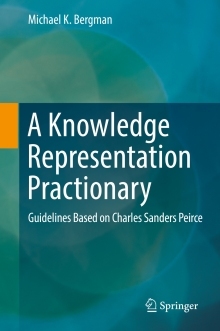 Frankly, this is good, because I share the view there has been some confusion regarding the predicate and misapplications given its semantics. The built-in OWL property owl:sameAs links an individual to an individual . Such an owl:sameAs statement indicates that two URI references actually refer to the same thing: the individuals have the same “identity”. A link is a predicate is an assertion. It by nature ties (“glues”) two resources to one another. Such an assertion can either: (1) be helpful and “correct”; (2) be made incorrectly; (3) assert the wrong or perhaps semantically poor relationship; or (4) be used maliciously or to deceive. To date, almost all inter-source Linked Data links have occurred via owl:sameAs. If we liken this situation to early child language acquisition, it is like we only have one verb to describe the world. And because our vocabulary is relatively spare, we have tended to apply sameAs to situations and relations that, comparatively, have a bit of semblance to baby-talk. So long as we have high confidence two disparate sources are referring to the same individual with the same identity, sameAs is the semantically correct RDF link. In all other cases, the use of this predicate should be suspect. Simple string or label matches are insufficient to make a sameAs assertion. If sameAs can not be confidently asserted, as might be the case where the relation of individual referents is perhaps likely but uncertain, we need to invoke new predicates or make no assertion at all. And, if the resources at hand are not individuals at all but classes, the need for new semantics increases still further. As we increase the size of the Linked Data ‘cloud’ or show rapid growth in Linked Data, we should be aware that quality, not size, may be the most important metric powering acceptance. The community has made unbelievable progress in finally putting real data behind the semantic Web promise. The challenge now is to add to our vocabulary and ensure quality assertions for the linkages we publish. One of UMBEL’s purposes, for example, is to broaden our relations to the class level of subject concepts. As we move beyond the early days of FOAF and other early vocabularies, we will see further richening of our predicates. We also need predicates and predicate language that reflects the open-world nature  of public Linked Data and the semantic Web. So, while sameAs helps us aggregate related information about the same identifiable individual, the predicates of class relations in context to other classes helps to put all information into context. And, if done right — that is, if the semantics and assertions are relatively correct — these desired contextual relations and interlinkages can blossom. isLikely — the predicate for likely relations between the same identifiable individual, but where there is some ambiguity or uncertainty short of a sameAs assertion. Most people active in the semantic Web and Linked Data communities believe a decentralized Web environment leads to innovation and initiative. Open software, standards activities, and vigorous community participation affirm these beliefs daily. The idea of context and global frames of reference, such as represented by UMBEL or perhaps any contextual ontology, could appear to be at odds with those ideals of decentralization. But one paradox is that without context, the basis for RDF linkages is made much poorer and therefore the potential for the benefits (and thus adoption) of Linked Data lessen. The object lesson should therefore not be a rejection of context. Indeed, any context is better than no context at all. Of course, whether that context gets provided by UMBEL or by some other framework(s) remains to be seen. This is for the market to decide. But the ability of contextual frameworks to richen our semantics should be clear. The past year with the growth and acceptance of Linked Data have affirmed that the mechanisms for linking and relating data are now largely in place. We have a simple, yet powerful and extensible data model in RDF. We have beginning vocabularies and constructs for conducting the data discourse. We have means for moving legacy data and information into this promising new environment. Context and Linked Data are not in any way at odds, nor are context and sameAs. Indeed, context itself is an essential framework for how we can orient and grow our semantics. Human language required its referents in the real world in order to grow and blossom. Context is just as essential to derive and grow the semantics and meaning of the semantic Web. The early innovators of the Linked Open Data community are the very individuals best placed to continue this innovation. Let’s accept sameAs for what it is — one kind of link in a growing menagerie of RDF link predicates — and get on with the mission of putting our enterprise in context. I think we’ll find our data has a lot more meaningfully to say — and with more coherence. See the original post for the full comment; shown with some minor re-formatting. Hu Yijun, 2006. On the Essence of Discourse: Context Coherence, see http://www.paper.edu.cn/en/downloadpaper.php?serial_number=200606-221&type=1. Also Jaffri et al. (Afraz Jaffri, Hugh Glaser and Ian Millard, 2008. URI Disambiguation in the Context of Linked Data, paper presented at LDOW2008, see http://events.linkeddata.org/ldow2008/papers/19-jaffri-glaser-uri-disambiguation.pdf) note that misuses of sameAs may result in a large percentage of entities being improperly conflated, entity references may be incorrect, and there is potential error propagation when mislabeled sameAs are then applied to new instances. As the authors state, “This will have a major impact on the Semantic Web when such repositories are used as data sources without any attempt to manage the inconsistencies or ‘clean’ the data.” The authors also pose thoughtful mechanisms for addressing these issues built on the hard-earned co-referencing experience gained within the information extraction (IE) community. These observations are not in any way meant to be critical or alarmist. They simply point to the need for quality control and accurate semantics when asserting relationships. These growing pains are a natural circumstance of rapid growth. W3C, OWL Web Ontology Language Reference, W3C Recommendation, 10 February 2004. See http://www.w3.org/TR/owl-ref/. Note that in OWL Full sameAs can also be applied to classes, but that is a special case, not applicable to how Linked Data has been practiced to date, and is not further discussed here. In the concept of context, we see all of the components and building blocks of RDF itself. Context is the essence of the semantic Web and Linked Data, not somehow in variance or conflict with it.